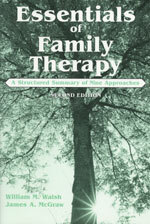 This text provides a concise overview of several popular systemic approaches to family therapy using a consistent format. This enables readers to quickly identify similarities and differences among the models. The audience will be counseling and social work graduate students in family systems and in marriage and family therapy classes. Clinicians in practice and professionals preparing for licensure examinations will also find this book to be very helpful. Recent research findings on models of family therapy are included. The first chapter now includes a brief discussion of first- and second- order cybernetic models plus an overview of family therapy outcome research. Each chapter starts with a list of key terms designed to serve as an advanced organizer for readers. Narrative family therapy has been expanded, along with descriptive summaries of emotionally focused therapy, multi-systemic therapy, and feminist family therapy.